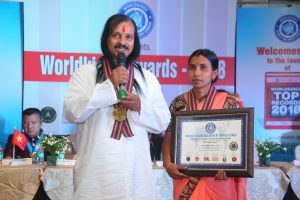 Sri Sri Aryamaharishi was felicitated with Golden Disk Award at Worldkings Awards 2018, held at Hotel Radisson Blu, New Dehi dated 11 November 2017, which fell on a Saturday. It so happens that sometimes, coincidences bring people in contact with each other and they become life-long partners. 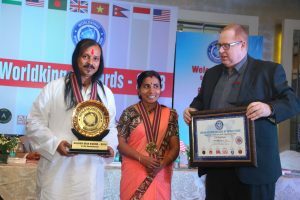 This, may have probably happened with Sri Sri Aryamaharishi and his wife now, Simi M S, when both of them became Kidney donors of their respective organs on a same day in 2014, donating them to two different needy people and giving them a new lease of life altogether. Now, coming to the present scenario, both husband and wife, undertake mass donations of organs Kidneys and others under their care, jurisdiction, encourage people, prospective donors on these lines with Sri Sri Aryamaharishi even keeping fasts during Islamic Ramzan month for the purpose, giving a new meaning, strength to country’s secularism aspect in total.